Hmmm... I think I have been hit by the ginger milk curd bug. I went to sleep last night thinking what if this and what if that, wondering what will happen if I change this or that for the ginger milk curd recipe. So this morning, armed with a new big pack of milk (Hubby was kind enough to change brand for me, I like HL milk), I tried again. Since I have a opened pack of Dumex All-In-One milk formula, I tested that as well. 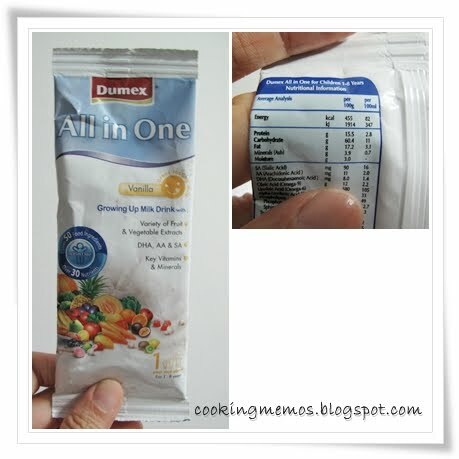 Thanks to all the goodie bags I received when I was pregnant, I had lots of these stashed in my cabinet. I opened them one by one for my baking experiments since I don't really like milk and these are not age appropriate for my baby. I only drink HL or Daisy Hi-Lo milk if I am forced to drink them as I dislike tremendously the creamy milky smell and taste. Being slightly lactose intolerant, all the more I avoid such products. Looking at the label, probably that explains why this milk is bearable for me as the fat content of this milk is low. HL don't work. I tried b4. 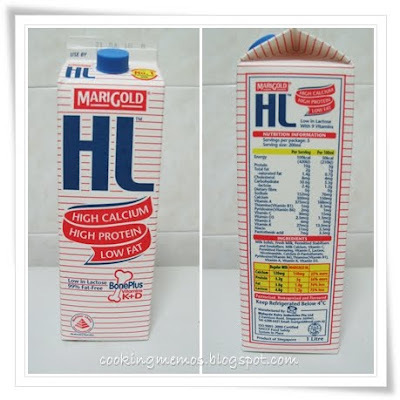 I read that the higher the protein level the better to make ginger milk curd, but this HL milk that has the highest level of protein doesn't work at all. You can tolerate this milk's taste cos it tasted vanilla rather than milky. If you are lactose intolerant, it has nothing to do with the fat level, lactose is milk sugar. I'm surprised the growing up milk worked!!! I tot recombined milk will not work. But you broke the myth, AGAIN!!!! Maybe milk for kids don't have too much weird stuff added in, maybe. I'm so so glad that there's someone who is totally challenged by this, as much as I was. Kudos to you, 3 entries for you!!! Wow, you have really been bitten hard by the bug!! ...and I thought milk powder wouldn't work! Bravo!!! I failed using Anmum Lacta, was thinking about HL.Since you've done it, I'll just skip that brand la. Wendy tried HL and worked. Think it's the amount of Ginger juice. I'm no big fan of ginger milk curd or any milk curd. Just plain curious. Haha. Hehe Wendy, I'm now the official myth breaker!